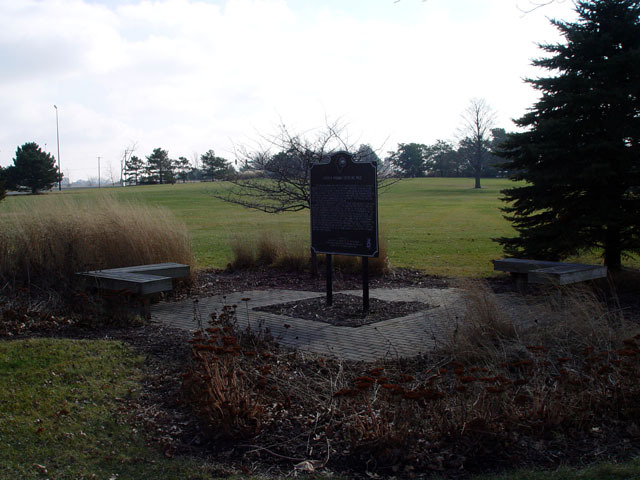 Located south entrance Kishwaukee college off Hwy 38 and Malta Rd. 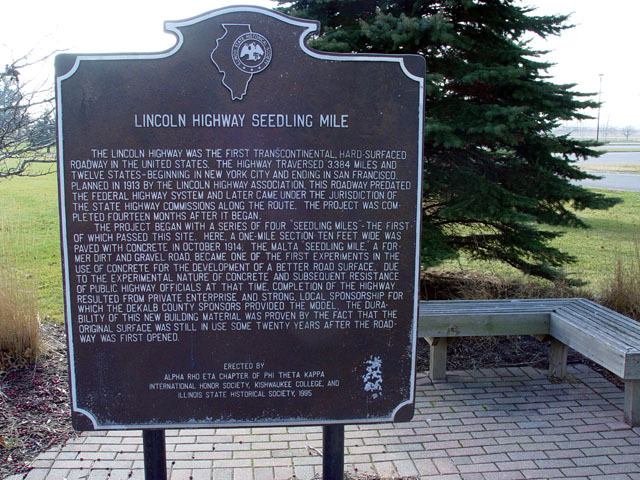 Malta IL Coordinates Lat N 41 56.242" Lon W 88 52.692 "
The Lincoln Highway was the first transcontinental, hard surface roadway in the United States. The Highway traversed 3,384 miles and twelve states - beginning in New York City and ending in San Francisco. Planned in 1913 by the Lincoln Highway Asssociation, this roadway predated the Federal Highway System and later came under the jurisdiction of the State Highway Commissions along the route. The project was completed fourteen months after it began. The project began with a series of four 'seedling miles'--the first of which passed this site. Here, a one-mile section ten feet wide was paved with concrete in October 1914. The Malta 'seedling mile,' a former dirt and gravel road, became one of the first experiments in the use of concrete for the development of a better road surface. Due to the experimental nature of concrete and subsequent resistance of public highway officials at that time, completion of the Highway resulted from private enterprise and strong, local sponsorship for which the DeKalb County sponsors provided the model. The durability of this new building material was proven by the fact that the original surface was still in use some twenty years after the road way was first opened.